After a year marked by steady continual increases in San Antonio area home sales figures, January carried that momentum into the new year with a moderate two percent increase year-over-year in total home sales, with a total of 1,788 homes sold according to the Multiple Listing Service Report from the San Antonio Board of REALTORS® (SABOR) which reports on all areas contained within the MLS. The average price of a San Antonio area home in January also saw a two percent increase from last year to $249,477 while the median rose three percent to $217,200. Months of inventory edged up slightly to 3.4 months in January following the 3.2 months reported in December and the month ended with 2,255 sales still pending. 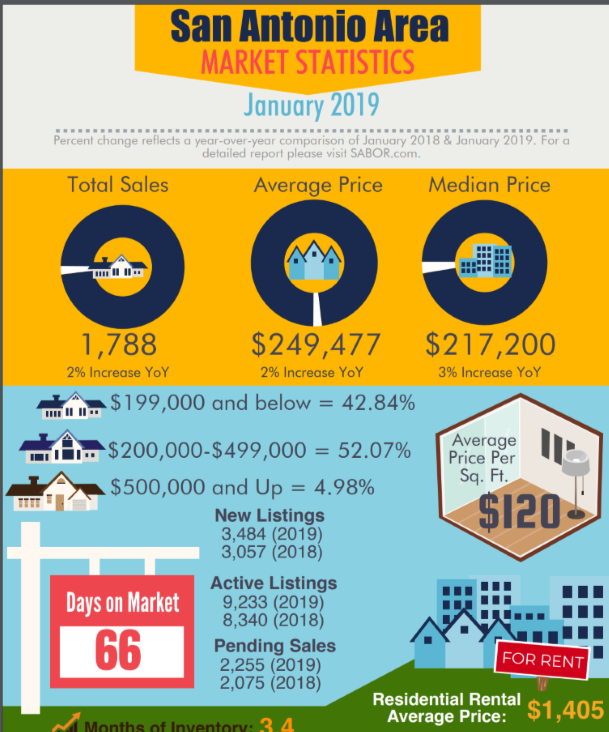 In January 2019, 43 percent of the homes sold were priced under $199,000 while another 52 percent were those priced between $200,000 and $499,000. The remaining five percent of homes sold were priced over $500,000. In Bexar County, home sales increased 2.4 percent from last year for a total of 1,341 homes sold with an average sales price of $239,836, a three percent increase from 2018. Months of inventory remained low at 3.0 months available and the price per square foot increased 5.6 percent to $114. For the state of Texas, total sales in January decreased five percent to 16,834. However, the average sales price rose 2.9 percent to $268,424 and the median increased 2.1 percent to $222,565. The state reported 3.4 months of inventory available. If you are thinking of buying or selling a home in the San Antonio metropolitan area, and want to work with a trusted San Antonio REALTOR® throughout the process, contact Trudy Edwards of KELLER WILLIAMS Realty Heritage, at (210) 595-9801, or by email at TrueSARealEstate@gmail.com.